PLEASE NOTE: This show has now sold out! Join our mailing list, at the top of the page, for updates about future Wave Pictures shows. 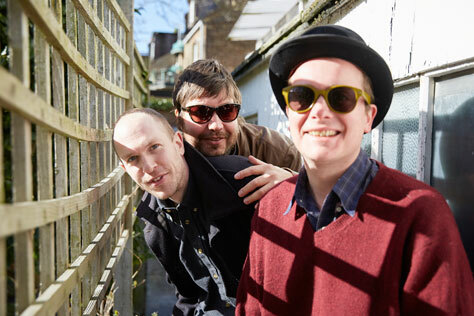 We’re delighted to be bringing The Wave Pictures back to Soup Kitchen! For Look Inside Your Heart, they tap in to a rich and varied musical palette, with opening track Roosevelt Skyes named as a tribute to the great piano bluesman, an African pop party in the vein of The Four Brothers and The Bhundu Boys. Whilst House By The Beach is a love song intended for the young Elvis Presley to cover in an alternate universe, with a familiar 50s call and response chorus. Shelly features guest vocals from Holly Holden from Holly Holden y Su Banda, which is a love song in the laid back style of early 70s Grateful Dead. Dodge City Blues uses the words from a beatnik prose poem from the mind of Sam James, as Tattersall explains; ‘the greatest singer-songwriter in New York City, a mysteriously neglected individual possessed of free flowing genius’. Further wearing their influences on their sleeves but giving them a very distinctive Wave Pictures spin, Hazy Moon sounds like Exile on Main Street-era Rolling Stones with Tom Verlaine on lead vocals, whereas Close Your Eyes Mike recalls Highway 61 Revisited-era Bob Dylan with Nigel Blackwell from Half Man Half Biscuit on lead vocals and Tell Me That You Weren’t Alone sounds like Astral Weeks-era Van Morrison as re-recorded by Jonathan Richman and The Modern Lovers. Support comes from Seazoo, an act that started out as nothing more than a bedroom-recording project in 2013. Surprising momentum built, however, as their Grandaddy/Yo La Tengo/SFA-inspired recordings began to gain support from the BBC. Huw Stephens, Lauren Laverne, Steve Lamacq, Mark Radcliffe have all played previous tunes from the Ken, Car Deborah and JUMBO EPs. Rather excellently, Marc Riley invited them to perform a live session for his 6 Music show. They accepted, ferociously.